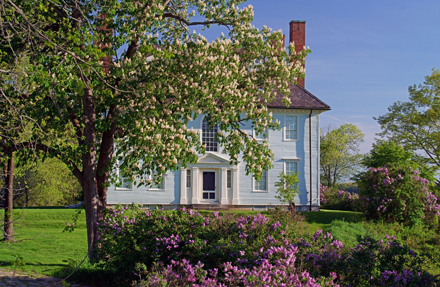 Hamilton House (c 1785), South Berwick, Maine, spring 2018. View of North facade through flora. 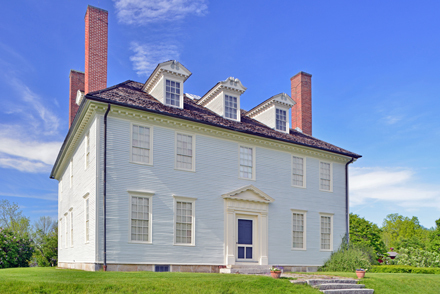 Hamilton House (c 1785), South Berwick, Maine, spring 2018; North and East facade. 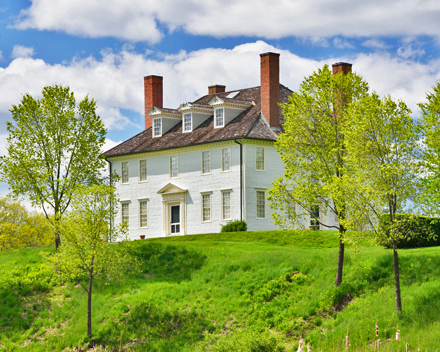 This dramatic, late Georgian mansion on a promontory above the Salmon Falls River (formerly Newichewannock River) was built by Jonathan Hamilton who amassed a fortune partly through privateering during the American Revolution. 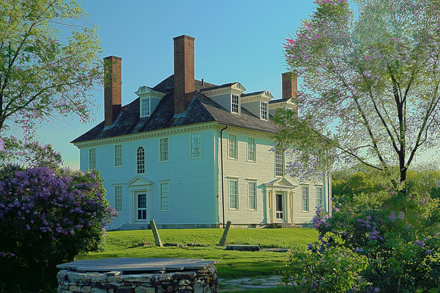 We see four corner chimneys, a hipped roof with broken-scroll pedimented dormers and a double-columned entablature under the arched window on the north facade. 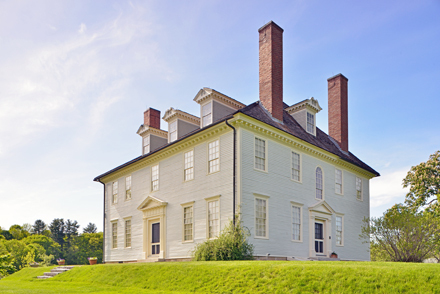 Hamilton House (c 1785) South Berwick, Maine, spring 2014; South and East facades from southeast. Hamilton House (c 1785) South Berwick, Maine, spring 2014; South facade from southwest. 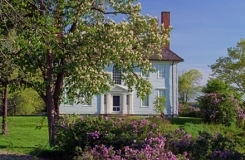 Hamilton House (c 1785), South Berwick, Maine; South facade in spring. Hamilton House (c1785), South Berwick, Maine; East side from garden in fall. 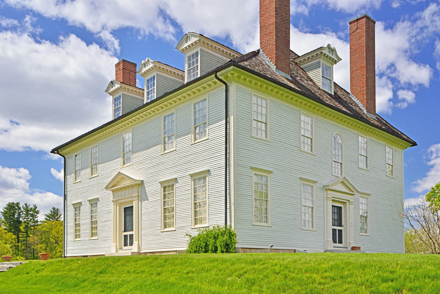 Hamilton House (c 1785), South Berwick, Maine; South and east sides. Hamilton House (c 1785), South Berwick, Maine; South facade in spring (1973 photograph). Hamilton House (c 1785), South Berwick, Maine; South facade and East end from Vaughan Woods State Park. 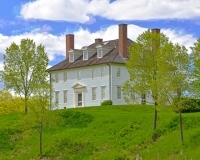 McIntire Garrison House (c. 1707) York, Maine. Garrison houses were built for defense in time of Indian attack. They were constructed of heavy hewn logs dovetailed together. Part of this work is shown in the detail of the structure in the adjoining image. 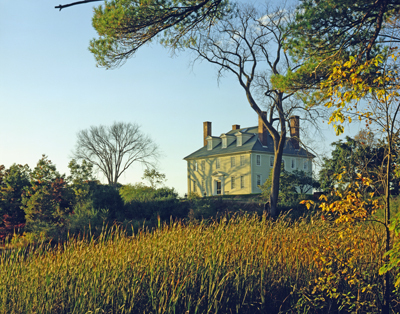 When an attack occurred neighbors would come together in the nearest garrison house, leaving their own homes which were often burned. 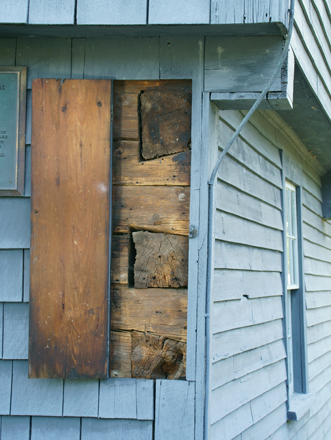 The clapboards we see in the photograph were undoubtedly added later as they would have made the building vulnerable to fire during an attack. 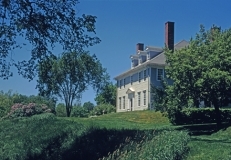 McIntire Garrison House (c. 1707), York, Maine; detail of south end where access is provided to show the original exterior appearance. Sarah Orne Jewett House (1774), South Berwick, Maine. 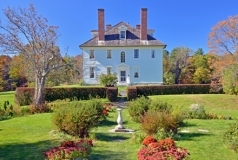 This assertive Georgian mansion sits in the center of town. It was the home of the noted author of novels and short stories about rural New England and coastal Maine. 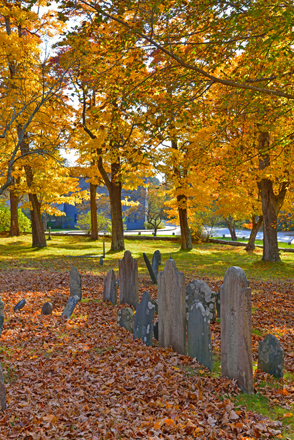 Old York Cemetery, York, Maine. Here are buried the remains of the victims of the February 1691/92 massacre of innocent colonists by Abenaki Indians encouraged and assisted by the French. Here, also is the grave of Jonathan Sayward, distinguished citizen who served in many civic posts, participated in the 1745 Louisbourg Expedition, and though a loyalist at the time of the American Revolution, was still beloved by the people of the town. 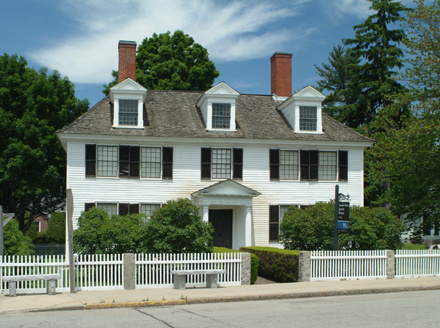 Jefferds Tavern (1750), Old York, Maine. 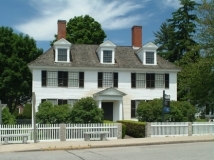 Originally situated in Wells, Maine, the tavern was moved to York where it was re-erected. 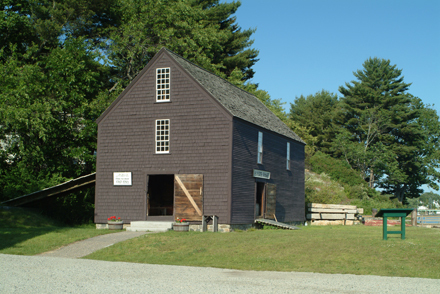 John Hancock Warehouse (thought to be c 1740s), York, Maine. 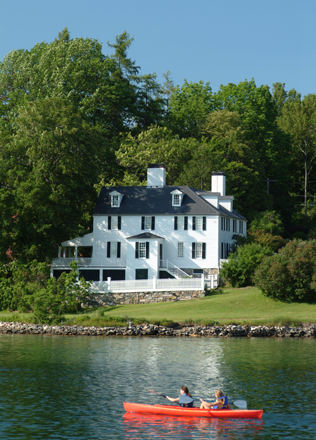 Only remaining commercial building along York River from colonial times. 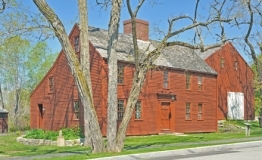 John Hancock acquired the property via mortgage. 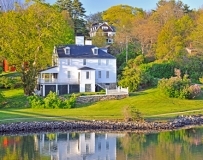 Sayward-Wheeler House (c1718), York Harbor, Maine; Horizontal view with reflection. 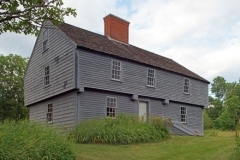 Jonathan Sayward participated in the 1745 Louisbourg expedition. 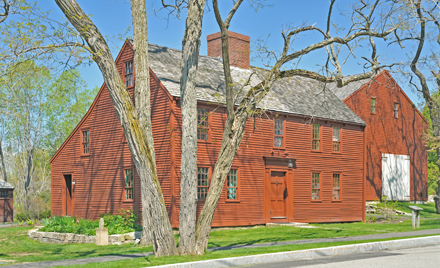 He remained a loyalist at the time of the American Revolution but was popular enough to be tolerated by neighboring patriots. 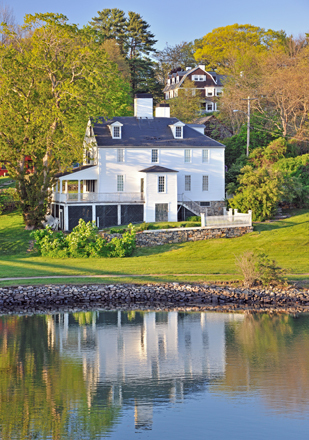 Sayward-Wheeler House (c1718), York Harbor, Maine; Vertical view with reflection. 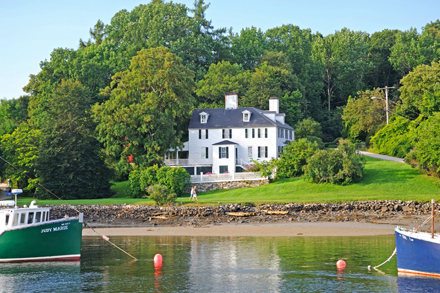 Sayward-Wheeler House (c1718), York Harbor, Maine; View at low tide. Sayward-Wheeler House (c 1718), York Harbor, Maine; View with kayak.